North Korea, or the Democratic People’s Republic of Korea (DPRK), has always been somewhat of an oddity. Closed off to the world, the only exposure we’ve had to the country are fleeting images and stories, ranging from the frightening to the eccentric: the sour face of former US President Bill Clinton with Dear Leader, Kim Jong Il; the harrowing plight of reporters Euna Lee and Laura Ling ; the Dear Leader’s penchant for toro, fatty tuna belly; human rights abuses, rumours of political stand-ins, and the grinding poverty of its people. This would often be enough to deter most people, but for the brave of heart, Koryo Tours is one company that specializes in tours to North Korea. Simon Cockerell, a Brit and one of Koryo’s tour leaders, was once a participant himself eight years ago. That same year, he joined the team as general manager, and he now goes to North Korea once a month. Below, Cockerell provides his five takeaways of DPRK. 1. North Korea is not as closed as we think it is. There is a misconception that no one can visit North Korea. In fact, North Korea does has some tourism albeit it being very small – approximately 2,000 people visit North Korea each year. “We take about 50% of these 2,000 people – 10-15% of them are US citizens, and we take about 80-85% of the Americans. We’re the only specialists in the field. Besides not knowing that you can visit North Korea, it’s expensive to visit. However, once you get over that, the visa process is quite easy – they don’t generally arbitrarily deny visas, but it is harder for journalists and South Korean citizens to get in. Generally, Americans can only go for certain parts of the year,” explains Cockerell. 2. North Korea is actually quite a safe place to visit. In 2008, a South Korean woman, Park Wang-Ja, was visiting a North Korean resort. She was reportedly shot and killed by the military after allegedly sneaking away from the resort in the middle of the night. However, this story doesn’t seem to be representative of most tourist accounts. “Certainly there are some restrictions – tourists aren’t allowed to wander off anywhere they want, and generally they are asked to stick to an all-inclusive itinerary that doesn’t involve wandering around town – but they are generally not in danger. They just have to be aware of some limitations,” explains Cockerell. “There isn’t really any danger or risk of large scale uprisings or petty crime in DPRK for tourists – I’ve never heard of anyone being mugged, robbed, or taking any specific precautions before going,” says Cockerell. North Korea is a fairly spartan nation. However, there are some highlights worth seeing. “Every year, there’s an event called the Mass Games – this is what most people go to see. It’s enormous, and takes place over a 10 week period in October. Sixty to seventy percent of the market goes at this time. 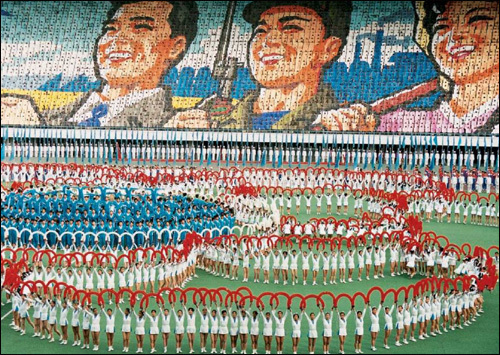 The Mass Games are a spectacle of synchronized music, dance, sports and propaganda, not unlike the Beijing Olympics opening ceremony. Over 100,000 performers take part in a 90 minute show over this period every single day,” explains Cockerell. People often visit during leaders’ birthdays and other holidays too. “Really, the real highlight is just going there, and seeing what it’s like. Every time I go back, I feel like I learn something new,” says Cockerell. 4. North Koreans are friendly; but somewhat suspicious of foreigners. There is another assumption that North Koreans, who are under state control, are not authorized to speak with foreigners. This is untrue. However, that is not to say that they will never speak with you. 5. When all else fails, football is always a good fallback. Cockerell often organizes friendly exhibition matches in North Korea. “Football is a friendly game – it’s the world’s biggest sport, and there are very few exceptions in the world where people aren’t interested in it. We’ve had teams from Beijing, Hong Kong, Singapore, the Netherlands – play against Korean teams. We arrange a game, have lunch, talk about football – if you can’t talk about anything else, if there’s absolutely nothing else to talk about, we’ve got football. Someone always has an opinion on Manchester United,” jokes Cockerell. Interesting post. North Korea is something that is very compelling to me in so many ways. Such a terrible government, such oppressed people, a divided peninsula and still tied to a rich and independent Korean culture. Here is a website I read quite often that may interest you; http://freekorea.us/ Very conservative in its viewpoint, but I find it very informative. Also, there is a Google Earth application done by a PhD student at George Mason University which analyzed North Korean satellite photos and presented their findings. It is an amazing window into North Korea; it’s horrendous gulag system, it’s elite palaces, it’s extensive military complexes. I’ve RSS’ed your blog. Looking forward to more posts! Hope you are well! Fascinating websites, Dave! Thanks for sharing them, and thanks for RSSing too. 😀 Hope you’re well! subject for ages and yours is the best I’ve found out so far.